Dieters are often looking for quick and simple ways to slim down. If you're trying to lose weight, there is one simple change that can make a big difference. You can learn how to stop drinking soda. Sweetened soda and other high-calorie drinks can add inches to your waistline if you drink them on a regular basis. Calories in soda add up quickly, regardless of the brand you buy. Not only are most of the beverages high in sugar and calories, but we also have a habit of drinking them mindlessly. The calories in Coke, for example, are fairly straightforward if you drink a single can. There are 140 calories and 39 grams of sugar in a single 12-ounce serving. That means Coca-cola provides about 12 calories per ounce. Calories in Canada Dry Ginger Ale are roughly the same and the calories in Pepsi are slightly higher with about 12.5 per ounce. Most brands of soda have calorie counts that are similar. Soda calories don't look that bad when you look at those numbers. But, if you're a fan of the super-sized drinks that you buy in fast food restaurants or convenience stores, you can easily consume several hundred calories in a single sitting, without ever eating any food! Unfortunately, you're not off the hook if you skip soda, but consume other sugary drinks. There are some soda alternatives that provide just as many calories and just as much added sugar as a sweetened soda. Sports drinks, for example, look like they are healthy. But many of them are full of calories. In fact, consuming a sports drink after exercise can undo the calorie deficit that you worked hard to create. In some cases, exercisers benefit from some ingredients in sports drinks. Endurance athletes may need sodium and potassium, but you can make your own fluid replacement drink by adding 2 tablespoons of lemon juice and a small pinch of salt to a cup of water. Juice is another high-calorie drink that may cause problems. Juice provides calories that come from natural sugars found in fruit, but fruit juice doesn't provide as many health benefits as eating whole fruit. In some cases, a glass of juice provides just as many calories as soda. Juices with the lower nutritional value include apple juice, white grape juice, and pear juice. Juices with the highest nutritional value include orange juice, purple grape juice, cranberry juice, tomato juice, and vegetable juice. Lower sugar juices include tomato juice, vegetable juice, and some cranberry juices (although not cranberry juice cocktail drinks). Have you ever calculated the number of soda calories you consume each year? A few simple math calculations reveal the truth. If you drink 50 ounces of soda per day (that's the size of a 7-11 Double Gulp), you consume 600 extra calories per day or 219,000 additional calories per year. If you drink 40 ounces of soda per day (the size of 7-11 Super Big Gulp), you consume 480 extra calories per day or 175,200 additional calories per year. If you drink 30 ounces of soda per day (the size of a 7-11 Big Gulp or a large soda at McDonald's), you consume 360 extra calories per day or 131,400 additional calories per year. If you drink 20 ounces of soda per day (the size of a 7-11 Gulp), you consume 240 extra calories per day or 87,600 additional calories per year. If you drink 16 ounces per day (the size of a medium drink at McDonald's), you consume 192 extra calories per day or 70,080 additional calories per year. If you drink one 12-ounce can of soda per day, you consume 144 extra calories per day or 52,560 additional calories per year. It's not just the calories that accumulate over time. Soda is expensive. Have you ever thought about the amount of money you would save if you cut out the trip to the convenience mart or fast food restaurant? A soda generally costs between $2-$3 when you buy it at a fast food restaurant. Again, that doesn't seem like a lot of money, but that nominal cost adds up to $730-$1,095 over the course of a year. Wouldn't it be great to have that money to spend on other things? And of course one of the greatest benefits of quitting the soda habit is weight loss. So how much weight can you lose when you stop drinking soda? These numbers might boost your motivation to cut back. Each calculation assumes that you don't replace soda calories with other food or beverage calories. If you replace your daily Double Gulp (50 ounces) with water, you reduce your annual calorie intake by 219,000 calories or about 60 pounds in a year. If you replace your daily Super Big Gulp (40 ounces) with water, you reduce your annual calorie intake by 175,200 calories or about 50 pounds in a year. If you replace your daily Big Gulp (30 ounces) with water, you reduce your annual calorie intake by 131,400 calories or 37 pounds in a year. If you replace your daily Gulp (20 ounces with water, you reduce your annual calorie intake by 87,600 or calories or 25 pounds in a year. If you replace your daily medium Coca-Cola at McDonald's (16 oz), you reduce your annual calorie intake by 70,080 calories or about 20 pounds in a year. If you replace your daily 12-ounce can of Coke with water every day, you save 52,560 calories per year or about 15 pounds in a year. Compare these numbers to how many calories you need daily to lose weight—you'll see that calories from soda add quite a bit to your daily calorie intake, without adding any valuable nutrition. Of course, to lose the amount of weight listed in the calculations, you need to be sure that you don't replace your soda calories with extra calories from food or other beverages, which leads many dieters to consider diet sodas to lose weight. Replacing your regular soda with a diet drink can be a tricky fix. Even low sugar drinks have calories, and artificially sweetened drinks have been known to cause problems in some people. In fact, you might be replacing one kind of addiction for another. Studies have shown that when we eat sweet foods, whether they are naturally or artificially sweetened, our appetites increase. So if you replace your regular pop with a diet variety you might be eliminating calories only to replace them again when your sugar craving kicks in. And experts who study artificial sweeteners recommend that it's best to avoid them if possible, especially if you are trying to lose weight. So how do you kick the soda habit? Switching to a diet pop might be the most gentle step down if you are used to having a full-calorie soda during the day. If you’re used to drinking a Big Gulp full of Coke, try having a smaller sized Diet Coke and several bottles of water instead. Gradually increase your water intake and decrease the soda. Not a huge fan of water? Learn how to make water taste better. There are no calories in club soda, so if you like the fizz of soda simply throw a few berries into a bubbly glass of water, or flavor your water with citrus or herbs. It becomes easier to switch to an all-water habit once you find a different beverage to enjoy. You can also try to taper off instead of going cold turkey. Note how much you drink, then reduce the amount by an ounce or two every week. Finally, try drinking with ice. You'll take in less sugar this way. 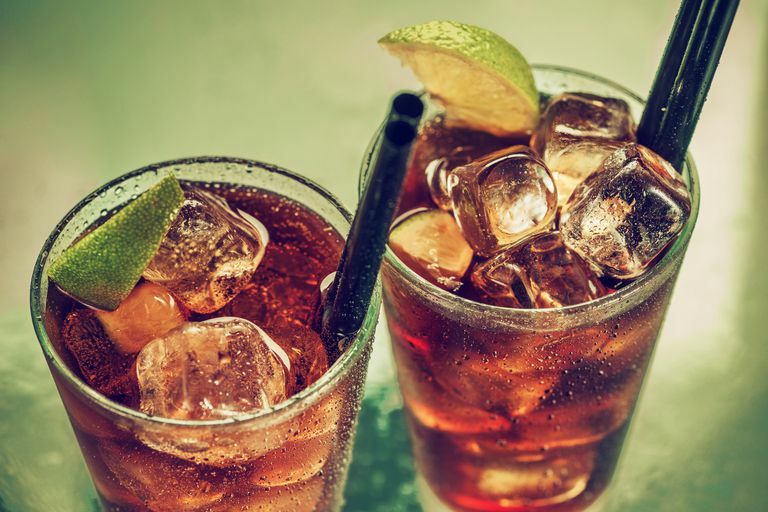 Drinking a sweetened soda, iced tea, or sports drink once in a while is not a problem for most people. We all love to indulge in a sweet treat every now and then, but when it becomes a regular habit it can cause problems for your body. With just a few simple changes, you can stop drinking soda to lose weight and improve your health. Eventually, you’ll feel better, your body will look better, and your piggy bank will thank you as well. Tandel KR. Sugar substitutes: Health controversy over perceived benefits. Journal of Pharmacology Pharmacotherapy. 2011 Oct-Dec; 2(4): 236–243. U.S National Library of Medicine. Caffeine in the diet. Medline Plus. Last reviewed April 29, 2015. Vartanian LR, Schwartz MB, Brownell KD. Effects of Soft Drink Consumption on Nutrition and Health: A Systematic Review and Meta-Analysis. American Journal of Public Health. 2007;97(4):667-675. doi:10.2105/AJPH.2005.083782. Yang Q. Gain weight by “going diet?” Artificial sweeteners and the neurobiology of sugar cravings. Yale Journal of Biology and Medicine 2010 June; 83(2): 101–108.